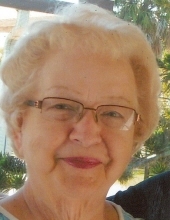 Judy Ann Winland, 76, of East Moline passed away Oct. 8, 2018 at Clarissa C. Cook Hospice House in Bettendorf following a brief illness. A celebration of life will be 12:30-2:30pm Friday at City View Celebrations at Trimble Point in Moline. Burial will be private at Greenview Memorial Gardens in East Moline. Memorials may be made to Clarissa C. Cook Hospice House. Quad Cities Cremation Center is assisting the family with arrangements. Judy was born Feb. 16, 1942 in Moline, IL the daughter of Robert and Annetta Brown and was raised by her mother Annetta and step father Kenneth Hites. She married Lewis A. Windland June 18, 1960. He preceded her in death June 11, 2017. Judy was an LPN who worked in Obstetrics at both Illini Hospital in Silvis and Finley Hospital in Dubuque. She later worked in Pediatrics at Illini Hospital. She was a very generous person who loved birds and flowers. If you wanted to make her smile, have a grandchild walk in the room. Survivors include her daughters Kathy Windland of Dubuque, Denise Harris (Jeff Bunch) of Olney, IL, Sherry (Steve) Fisher of Rosewood, WI and Rhonda (Dan) Massey of Grand Junction, CO; grandchildren Megan (Chad) Brown, Chad Harris, Kyle Harris, Nikki (Matt) Jones, Drake Fisher, Amber Massey and Jacob Massey; brother Robert Brown Jr.; sister in law Lola Odendahl and brother in law Bill Beard. Judy was preceded in death by her husband; parents; step father, brothers Darrell Brown and Dan Brown; step brother John Hites; brother in law Francis Odendahl and sister in law Carol Jean Beard. To plant a tree in memory of Judy Ann Windland, please visit our Tribute Store. "Email Address" would like to share the life celebration of Judy Ann Windland. Click on the "link" to go to share a favorite memory or leave a condolence message for the family.